Hello fellow yeast ranchers and Brett aficionados. Are you interested to be part of a large-scale Brettanomyces fermentation project? If yes, please read on. If not just ignore this post. All started with the latest update of my yeast database which now consists of close to 100 isolated yeast and bacteria strains. After the last database update in mid June 2013, Bikes, Beer & Adventures (aka Jeffrey Crane) contacted me and asked for the strains to give me feedback in return. Since I haven’t actually brewed with any of the strains yet and kind of postponed the testing part for later on, we both agreed on an experimental setup to test all the different Brettanomyces strains in a single Brett-beer experiment. Jeffrey and I came up with a nice experiment to test some of the Brettanomyces strains I currently have. The basic idea for this experiment is to brew a rather simple beer, split the batch and ferment the split parts with individual Brettanomyces strains only. Then evaluate the outcome of the beers, evaluate the individual strains and return the results to me (or make them otherwise available to me like posting on a blog etc). The recipe for this experiment, developed by Jeffrey, is mentioned below. As a participant of the BBA/EBY Brettanomyces Experiment you will receive a small amount of the Brettanomyces strain(s) from me, propagate them to have enough yeast to pitch, follow the recipe and procedure mentioned above, split the batch and let the shares ferment with the Brett strains. Then evaluate the beers and give me feedback about the individual strains. After the experiment, you are free to keep the individual strains and use them as you like. One request though, please only subscribe to the experiment if you follow the recipe, procedure mentioned above. There will be time for individual tests later on. 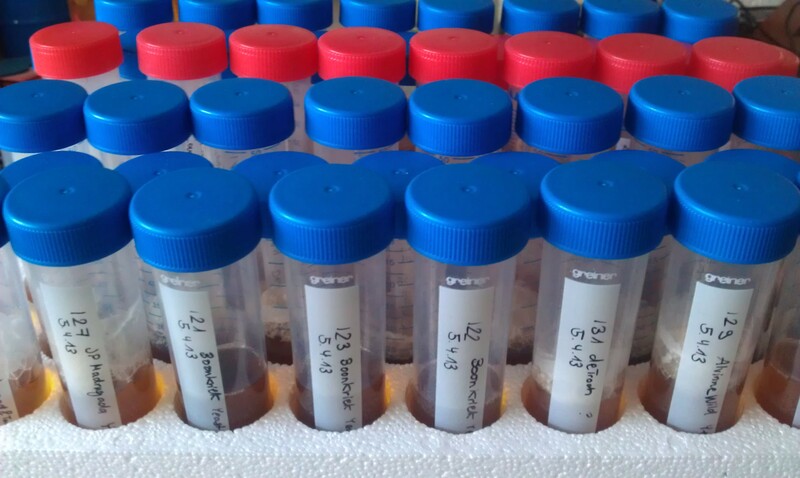 What about the individual Brettanomyces strains? EBY001 (B. girardin I), EBY002 (B. dreifonteinii I), EBY005 (B. cantillon I), EBY007 (B. italiana I), EBY008-013 (B. cantillon II to VII), EBY014-015 (B. lostfontain I and II), EBY016-017 (B. lambeek I and II), EBY019 (B. cucurbita I), EBY020 (B. jurassienne), EBY021 (B. bruery I), EBY035 (B. cucurbita II), EBY038 (B. cantillon VIII) and EBY048 (B. italiana II). For more information about the individual strains check out my page with all the strains I currently have (go to EBY program). Please only participate if you follow the recipe, procedure mentioned above. The whole purpose of this experiment is to get as much information about the strains as possible. Please further notice that I haven’t tested most of the Brettanoymces strains on full-scale yet. I therefore cannot make any predictions about the fermentation performance nor the aroma, flavor profile of the out coming beers. I wouldn’t be surprised if there are strains not suitable for fermenting beers. I would be really happy to get as much collaborators as possible. So please spread the word. If there are more collaborators out there than yeast strains, or the available yeasts are gone within an instant, I might even think about another re-release of yeast strains. If anything is not clear feel free to comment below or write me an email to contacteurekabrewing@gmail.com. This entry was posted in Experimental and tagged Brettanomyces, EBY, Eureka Brewing Yeast, Experiment by eurekabrewing. Bookmark the permalink. This is going to be a great project. If there are any homebrewers in the San Diego region, that are interested you can ask to add your yeast to my delivery. This looks awesome! I am most certainly in. This sounds fun. I’m in. Wow, really cool idea! This should lead to some very interesting results. I’d be interesting in participating, though I’ll be pretty busy (traveling a lot) around when you’re sending them out. Are you looking to have results back as quickly as possible, or just within a certain reasonable time frame? I don’t need the results as quick as possible. As far as Jeffrey told me, we are shooting for tastings somewhat around: after 4 weeks, 2 months, 6 months and maybe after one year. Just as an idea. It would be nice to get some feedback between the second and third tasting though. Just don’t feel obligated to hand in results as soon as possible. It looks like this was fairly popular. Most of the spots were filled when I signed up. This should be a fun experiment and let me make good use of all of those 1 gallon jugs that I have taking up space from my last experiment. This is really interesting experiment, and I’m excited to see the results as they come in. If you decide to do this again, I’d be really interested in participating. Cheers!